My name is Aida and I am a mother of 4 lovely kids. Of course I'm married.. its obvious, right? hahahaha.. I am a working mother. What I do for a living?? I devote my knowledge and wisdom to make people dream come true.. Wow.... pretty awesome huh? For a record, I have made lots of people dream comes true. Yes I did. But how about my dream?? Well.. my dream is simple.. I want to travel to as many country as i can with my family for as long as i live. So that when I'm gone my kids will still remember me every time they went for a trip themselves or with their own family. Travelling with small kids is not easy. Furthermore, we didn't use travel agent for most of our trip to save budget. So I have to make all the planning needed myself. The more I can save, the more trip we can go. Hence, my blog is created to share my experiences thus far. And I hope you find my experience helpful and enjoyable to read it, like I'm enjoyed writing it. 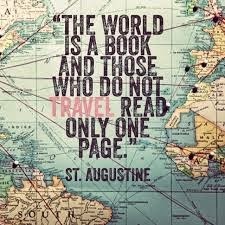 I would love to end with the best quote that encourage myself to travel. Have a nice reading and thanks.